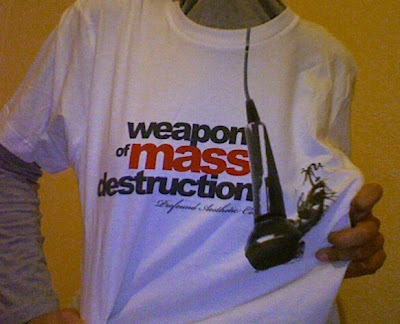 IT'S A NEW T-SHIRT! Added to me tee collection; only the bestest, shmexiest tee ever too. Or as one friend said, 'Dude, that's the business'. 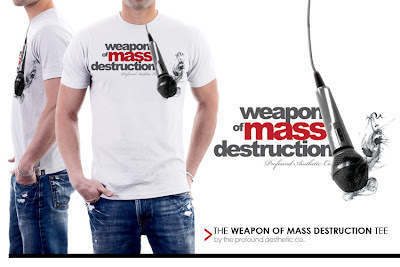 I Am Profoundly Aesthetic Tee: "Weapon of mass destruction." Cost: ONLY £13/$21 exc. shipping. Delivery: Less than 4 days (I'm in the UK). I had to go for this, the spin on the prostituted headline was perfect combined with my principle of using a scalp to cut back the media lies. Public show of it will make for great conversation, especially in my community. *shakes fist at screen* Take that media lies! And that, malignant tabloids! Profound Aesthetic are an interesting branding concept; they design for the outward with severely intellectual slogans, while focusing on developing on the inward for the wearer. Examples of this are blatantly obvious in the spiritual messages of 'Prophetic cultivation', 'Do the right thing' and 'Peace by Piece'. I did a Link Love feature of PA on sister site www.Muslimness.com. Rad designs. I just checked out the shop link. They have good stuff. @White orchid - They ARE very awesome, mashaAllah. Let me know if you buy owt. =) Oh, P.A. have also got an opening for marketing roles etc, worth a look.